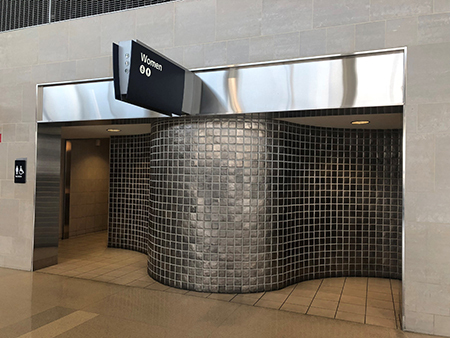 If you notice that the restrooms at Detroit’s Metropolitan Airport in Romulus are more-tidy this holiday travel season, credit an automated system launched today in the McNamara Terminal. The new data-driven analytics system — named TRAX® SmartRestroom by its creator, Atlanta-based Infax — monitors user traffic flow, sends real-time data alerts to staff, and allows travelers to report any issues via an installed tablet. According to Infax, its TRAX throughput counters monitor passenger foot traffic and hourly trends of each restroom. It also sends alerts to staff when it is time to clean a restroom. The system also predicts future traffic and service needs based on real-time flight information. Attendants wear TRAX SmartBadges, so the platform can monitor their arrival and the duration of their cleaning services. Finally, passenger feedback tablets are installed to allow passengers to give real time feedback on the restroom environment, which automatically alerts staff if a negative comment is reported. Smart technology has become increasingly popular in airports globally, according to Infax. Since 2015, there has been an 8 percent increase in the integration of sensor technologies at checkpoints to monitor traffic across international airports. Additionally, restroom cleanliness consistently ranks as a top-five satisfaction factor in passenger surveys, according to Airports Council International (ACI).